1. How can Rectification of Orders be done? 2. What is the time limit within which a taxpayer can file for rectification? 3. Can I file an application of rectification of Order if appeal is filed against that order? 4. What happens if a suo moto rectification done by an Adjudication Authority (A/A) adversely affects any person? 5. In the case of suo moto rectification done by A/A on one of the ARNs in my name, how will I come to know of that and where can I view the issued orders/notice on the GST portal? 6. What is the procedure of rectification of order? 7. What is the time limit for the completion of Rectification of Order related proceedings? 8. What happens on the GST Portal once I file an application for rectification of order? 9. What documents will I receive once Notice is issued? 10. What happens on the GST Portal once I file a reply? 11. What happens on the GST Portal if rectification order is issued? 12. What happens on the GST Portal if rectification application is rejected? How can I file an application for rectification of order and participate in the subsequent proceedings u/s 161? Rectification of order issued can be done on the basis of suo moto or upon receipt of application from taxpayer. Taxpayer must file the rectification application within a period of three months, from the date of issue of order. Period of three months shall not apply in such cases where the rectification is in nature of correction of clerical or arithmetical error. If appeal is filed against assessment order, then order cannot be rectified. If rectification adversely affects any person, then Adjudication Authority (A/A) will have to issue notice before making such rectification. Taxpayer files an application for rectification of order or an A/A initiates a suo moto rectification. A/A issues a notice to the taxpayer seeking additional clarifications and, if personal hearing is required, also schedules a date/time and venue. In case of no reply from the taxpayer, A/A issues a Reminder. Maximum three reminders can be issued. Taxpayer can reply to the issued notice and also request for a personal hearing in case A/A has not called for a personal hearing in the issued notice. Additionally, if required, he/she can also file for application of extension offline. If A/A approves application of extension, A/A will issue an adjournment with the new date/time and venue of Personal hearing, if required. Adjournment can be allowed maximum 3 times. If Personal hearing is not required, A/A, on the basis of taxpayer’s reply, issues an Order. If Personal hearing is required, A/A conducts the personal hearing and on that basis issue an Order. If taxpayer does not reply, even after the issue of three reminders, A/A issues the Order on his own motion. The Rectification Order must be passed by A/A within 6 months from date of original order except in case of clerical/arithmetical mistake. Acknowledgement screen is displayed, containing the generated ARN. The filed application will appear in the work item list of A/A and will be available in the ARN’s Case Details dashboard. You will receive two documents i.e. system-generated Notice for seeking clarification for rectification of order and annexure uploaded by officer. Notices and Orders page is displayed with the generated Reference number (RFN). You will receive an intimation of successful filing of your, along with the generated RFN. The REPLIES tab gets updated with the record of the filed reply in a table and with the Status updated to “Reply furnished, Pending for rectification order“. 2. Login to the portal with valid credentials. 4. My Applications page is displayed. Select “Application for rectification of order” in the Application Type field. Then, click the NEW APPLICATION button. 5. New Application page is displayed. Enter details in the displayed fields as mentioned in the following steps. Note: Currently, Status of the application is “Draft”. It will remain so until you file the application. 5a. In Original Order Number field, select the order number of the order that you wish to rectify. Based on your selection, Original Order Issue Date and Tax Period fields get auto-populated. 5b. In Grounds for rectification field, enter reason for filing this application. 5c. Click Choose File to upload the document(s) related to this application, if any. This is not a mandatory field. 5d. Enter Verification details. Select the declaration check-box and select the name of the authorized signatory. Based on your selection, the fields Designation/Status and Date (current date) displayed below gets auto-populated. Enter the name of the place where you are filing this application. 5e. Click PREVIEW to download and review your application. Once you are satisfied, click FILE. 6. Submit Application page is displayed. Click ISSUE WITH DSC or ISSUE WITH EVC. 7. Acknowledgement page is displayed with the generated ARN. You will also receive an SMS and email intimating you of the generated ARN and successful filing of the application. To download the filed application, click the Click here hyperlink or click CREATE NEW APPLICATION to go back to My Applications page. Note: Once the application is filed, Status of the application gets updated to “Pending for action by tax officer”. 4. Additional Notices and Orders page is displayed. Using the Navigation buttons provided below, search for the Orders related to Rectification of Orders. Click View hyperlink to go to the Case Details screen of that particular Order/Notice. 5. Case Details page is displayed. 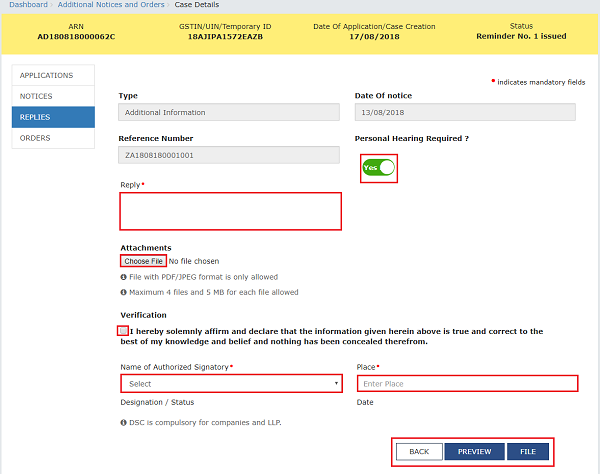 From this page, you can initiate acting on proceedings related to rectification of order u/s 161 by operating on the tabs provided at the left-hand side of the page: APPLICATIONS, NOTICES, REPLIES, ORDERS. Note 1: On this page, the APPLICATIONS tab is selected by default. Note 2: Currently, Status of the ARN/Case is “Pending for reply by taxpayer”. It will change as you act on the proceeding. 4. My Applications page is displayed. 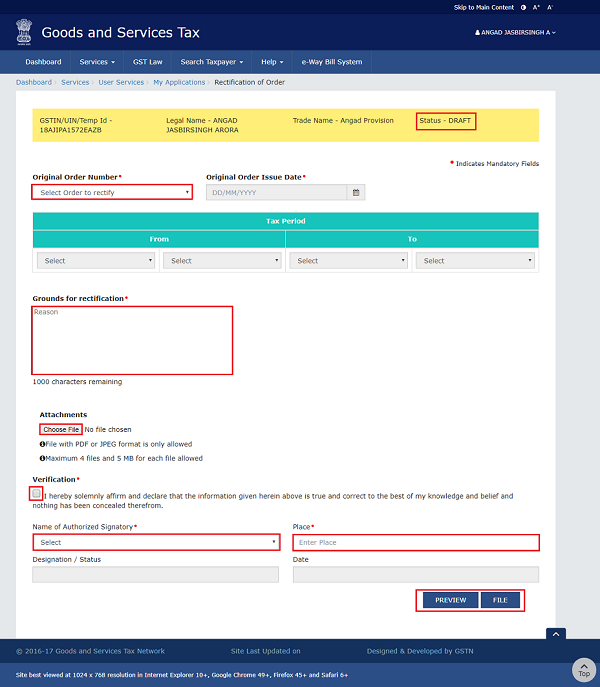 Select “Application for rectification of order” in the Application Type field, select submission period in the From Date field and To Date fields and then click SEARCH. 5. Based on your Search criteria, applications are displayed. Click the ARN hyperlink you want to open. 6. Case Details page is displayed. From this page, you can initiate acting on proceedings related to rectification of order u/s 161 by operating on the tabs provided at the left-hand side of the page: APPLICATIONS, NOTICES, REPLIES, ORDERS. Click BACK to go back to My Applications page. Note 2: Currently, Status of the ARN/Case is “Pending for action by tax officer”. It will change as you act on the proceeding. 1. On the Case Details page of that particular application, select the APPLICATIONS tab, if it is not selected by default. This tab provides you an option to view the filed application in PDF mode. Click BACK to go back to My Applications page. 2. Click the View hyperlink to download and view the application in PDF mode. 1. On the Case Details page of that particular application, select the NOTICES tab. This tab displays all the notices (Additional Information/Reminder/Adjournment) issued by Adjudication Authority (A/A). 2. Scroll to the right to view the document name(s) in the Attachments section of the table and click them to download into your machine. 1. On the Case Details page of that particular application, select the REPLIES tab. This tab will display the replies you will file against the Notice issued by Adjudication Authority (A/A). To add a reply, click ADD REPLY and select Additional Information. 2. Additional Information page is displayed. Enter details in the displayed fields as mentioned in the following steps. To go to the previous page, click BACK. 2a. In the Personal Hearing Required? field, select Yes or No. Note: This button is visible in only those applications where the A/A has not called for a personal hearing in the issued notice. 2b. In Reply field, enter details of your reply to the issued notice. 2c. Click Choose File to upload the document(s) related to your reply, if any. This is not a mandatory field. 2d. Enter Verification details. Select the declaration check-box and select the name of the authorized signatory. Based on your selection, the fields Designation/Status and Date (current date) displayed below gets auto-populated. Enter the name of the place where you are filing this application. 2e. Click PREVIEW to download and review your application. Once you are satisfied, click FILE. 4. Notices and Orders page is displayed with the generated Reference number. To download the filed reply, click the Click here hyperlink. Then, click OK.
5. The updated REPLIES tab is displayed, with the record of the filed reply in a table and with the Status updated to “Reply furnished, Pending for rectification order“. You can also click the documents in the Attachments section of the table to download them. 1. On the Case Details page of that particular taxpayer, click the ORDERS tab. This tab provides you an option to view the issued order, with all its attached documents, in PDF mode. 2. Click the document(s) in the Attachments section of the table to download them.